In September 2013, Google announced joining forces with edX to contribute to their open source platform, Open edX. Since then we’ve been working together to expand this open education ecosystem. We’re pleased to announce our first online course built using Open edX. 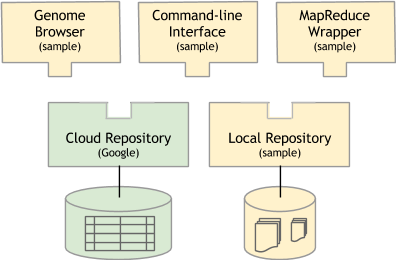 Making Sense of Data showcases the collaborative technology of Google and edX using cbX to run Open edX courses on Google App Engine. The world is filled with lots of information; learning to make sense of it all helps us to gain perspective and make decisions. We’re pleased to share tools and techniques to structure, visualize, and analyze information in our latest self-paced, online course: Making Sense of Data. Making Sense of Data is intended for anybody who works with data on a daily basis, such as students, teachers, journalists, and small business owners, and who wants to learn more about how to apply that information to practical problems. Participants will learn about the data process, create and use Fusion Tables (an experimental tool), and look for patterns and relationships in data. Knowledge of statistics or experience with programming is not required. Like past courses, participants engage with course material through a combination of video and text lessons, activities, and projects. In this course, we will also introduce some new features that help create a more engaging participant experience. For example, participants will be able to access instant hangouts and live chats from the course web page for quick help or for direct feedback. As with all of our MOOCs, you’ll learn from Google experts and collaborate with participants worldwide. You’ll also have the opportunity to complete a final project and apply the skills you’ve learned to earn a certificate. Making Sense of Data runs from March 18 - April 4, 2014. Visit g.co/datasense to learn more and register today. We look forward to seeing you make sense of all the information out there! This practice of “intensive forestry” is used all over the world to provide valuable commodities and bolster regional and national economies. WRI analysis suggests that if managers of production forests embrace a “multiple ecosystem services strategy”, they will be able to generate additional benefits such as biodiversity, carbon storage, and water filtration. The traditional territory of Brazil's Surui tribe is an island of green surrounded by lands that have been significantly degraded and deforested over the past 10+ years. Indigenous communities often rely on forests for their livelihoods and cultural heritage and therefore have a strong incentive to manage forests sustainably. 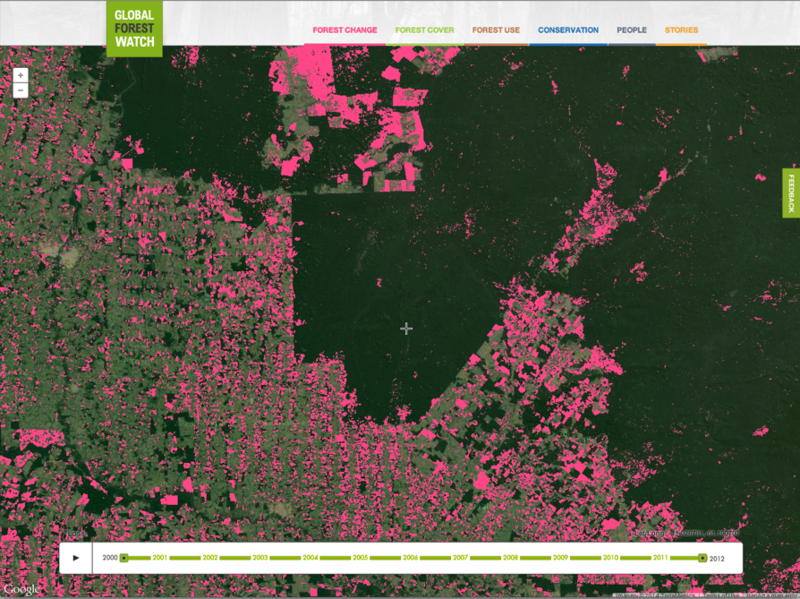 However, many indigenous communities struggle to protect their lands against encroachment by illegal loggers, which may be seen in Global Forest Watch using annual data from the University of Maryland and Google, or monthly alerts from Imazon, a Brazilian NGO and GFW partner. 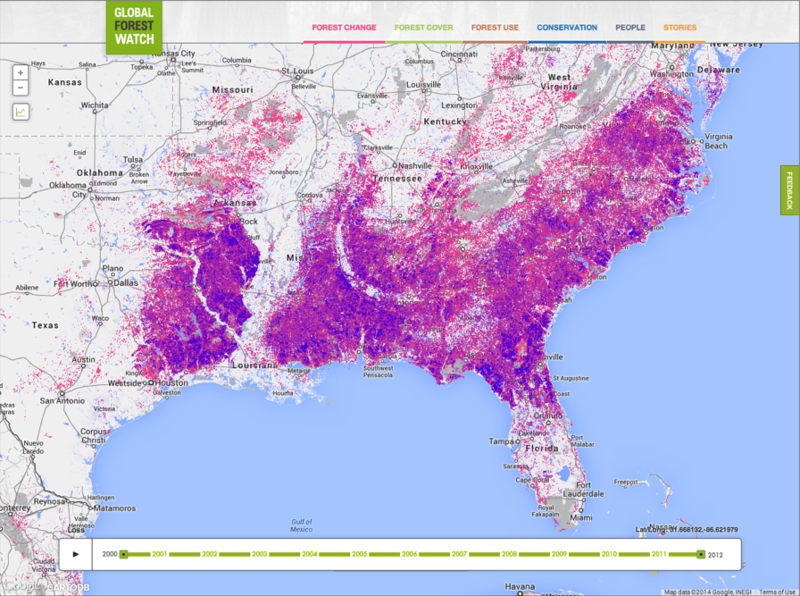 Previously, the data required to make these maps was difficult to obtain and interpret, and most people lacked the resources necessary to access, view, and analyze the the information. 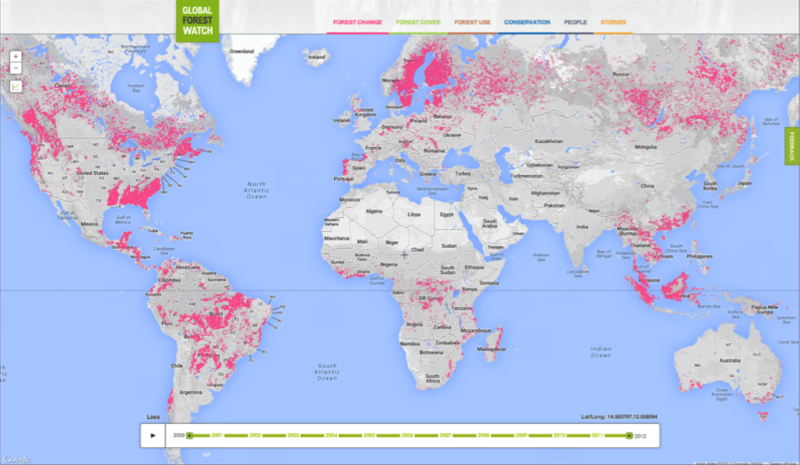 With Global Forest Watch, this data is now open to anyone with Internet access. 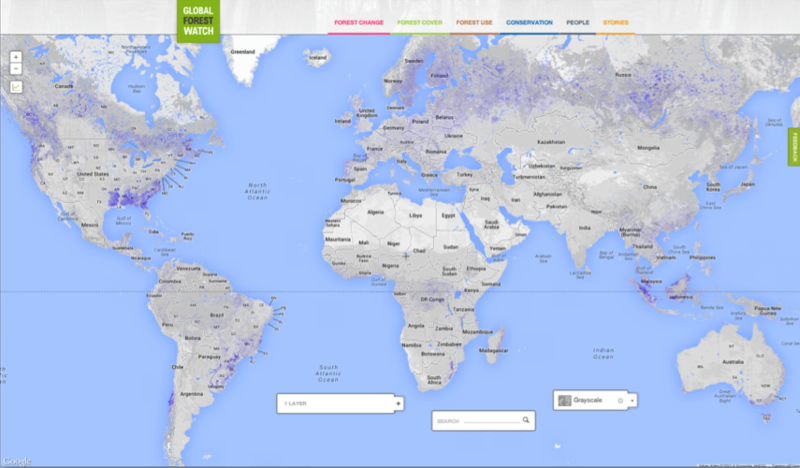 We encourage you to visit Global Forest Watch and make your own forest map. There are many stories to tell about what is happening to forests around the world—and your stories can lead to action to protect these special and threatened places. What story will you tell? Last fall, Google invited academic researchers to participate in a Computational Journalism awards program focused on the intersection of Computer Science and Journalism. We solicited proposals for original research projects relevant to today’s fast evolving news industry. As technology continues to shape and be shaped by the media landscape, applicants were asked to rethink traditional models and roles in the ecosystem, and reimagine the lifecycle of the news story in the online world. We encouraged them to develop innovative tools and open source software that could benefit readers and be game-changers for reporters and publishers. Each award includes funding of $60,000 in cash and $20,000 in computing credits on Google’s Cloud Platform. We congratulate the recipients of these awards, whose projects are described below, and look forward to the results of their research. Stay tuned for updates on their progress. This project aims to develop computational methods for identifying abstract themes or "angles" in news stories, e.g., seeing a story as an instance of "pulling yourself up by your bootstraps," or as a "David vs. Goliath" story. In collaboration with journalism and computer science students, we will develop applications utilizing these methods in the creation, distribution, and consumption of news content. Our goal in this project is to research, and then develop a data-mining tool that allows an online researcher to find and trace language reuse. By language reuse, we specifically mean: Can we find if in a current text some language was used that can be traced back to some other text or script. The technical innovation in this project is aimed at (1) identifying linguistic reuse in documents as well as other forms of material, which can be converted to text, and therefore includes political speeches and videos. Another innovation will be in (2) how linguistic reuse can be traced through the web and online social networks. InfoScribe is a collaborative web platform that lets citizens participate in investigative journalism projects by digitizing select data from scanned document sets uploaded by journalists. One of InfoScribe's primary research goals is to explore how community participation in journalistic activities can help improve their accuracy, transparency and impact. Additionally, InfoScribe seeks to build and expand upon understandings of how computer vision and statistical inference can be most efficiently combined with human effort in the completion of complex tasks. RumorLens is a tool that will aid journalists in finding posts that spread or correct a particular rumor on Twitter, by exploring the size of the audiences that those posts have reached. In the collection phase, the user provides one or a few exemplar tweets and then manually classifies a few hundred others as spreading the rumor, correcting it, or labeling it as unrelated. This enables automatic retrieval and classification of remaining tweets, which are then presented in an interactive visualization that shows audience sizes. We have just completed another round of the Google Research Awards, our biannual open call for proposals on computer science-related topics including robotics, natural language processing, systems, policy, and mobile. Our grants cover tuition for a graduate student and provide both faculty and students the opportunity to work directly with Google researchers and engineers. This round we received 691 proposals, an increase of 19% over last round, covering 46 countries on 6 continents. After expert reviews and committee discussions, we decided to fund 115 projects. The subject areas that received the highest level of support were human-computer interaction, systems, and machine learning, with 25% of the funding awarded to universities outside the U.S.
We set a new record this round with over 2000 reviews done by 650 reviewers. Each proposal is reviewed by internal committees who provide feedback on merit and relevance. In many cases, the committees include some of the foremost experts in the world. All committee members are volunteers who spend a significant amount of time making the Research Award program happen twice a year.